With the impending release of Hillary Clinton’s What Happened, Democrats have mixed reactions. Yes, she’s still well liked among the establishment elite. Yes, people think she has a right to pen a book about the 2016 election. They do not, however, think it’s the right time. Politico and The Hill reported about the reactions from Democrats as they prepare for Hurricane Hillary. The former first lady is reportedly mobbed by fans, with some of her first book tour events—all in states that she won—selling out. In short, people are tired of 2016 and exhausted of defending Clinton after she has consistently been unable to take responsibility for her actions. It’s always I take responsibility, but it’s really everyone else’s fault. In this case, it’s I accept that I had shortcomings in 2016, but Obama, Joe Biden, Bernie Sanders, the FBI, Russia, and sexism all colluded to torpedo my presidential hopes. 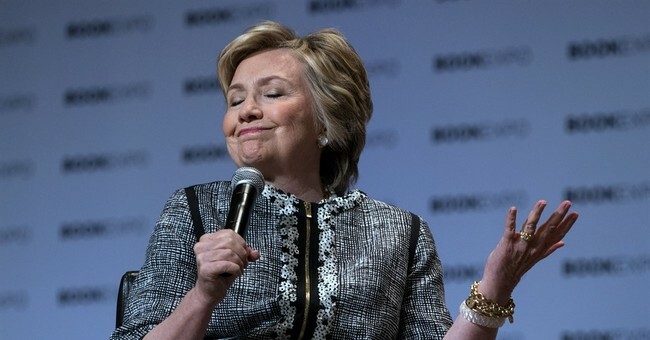 Honestly, admitting that you sucked is half the battle; Clinton has yet to embrace that step in moving forward. While the book does toss some mud at Biden and especially Sanders, the latter, a self-described democratic socialist, says it’s time to move forward. Still, Clinton enjoys widespread goodwill in Democratic circles. Most Democrats reached by The Hill did not want to speak ill of Clinton, feeling sympathy for her loss and believing that she’s still trying to come to grips with it. Asked again, she started shaking her head, walking away. It's not hard to imagine Trump belittling Clinton's book via his Twitter feed. But some Democrats have already beat him to it. “A Sad, Petty ‘It's Everyone Else's Fault,’ Book,” read an email from Sanders die-hard (and Clinton’s 2006 Senate primary opponent) Jonathan Tasini. “Pathetic. But it is a planned mass PR campaign in prep for the corporate #Dems next candidate. Reality: 75% did not vote 4 her. Denial,” tweeted RoseAnn DeMoro, the executive director of National Nurses United. The two-time presidential loser may be mobbed by adoring fans, but it doesn’t negate the fact that she only has a 30 percent approval rating, she’s only meeting friendly voters from deep blue states, and she seems to be a divisive force within the Democratic Party, even among her supporters. Get away from me seems to be the prevailing theme with Democrats. They’re tired of her. They want to move on, and now we’re going to have weeks of unhealed wounds being agitated as salt is poured into them again.